They’re nearly impossible to recycle, easily ingested by marine life — and totally unnecessary. Sep. 03, 2017, 8:30 a.m.
Last month, London Grill got rid of plastic straws. It was the video of the straw being pulled out of a turtle’s nose that did it. 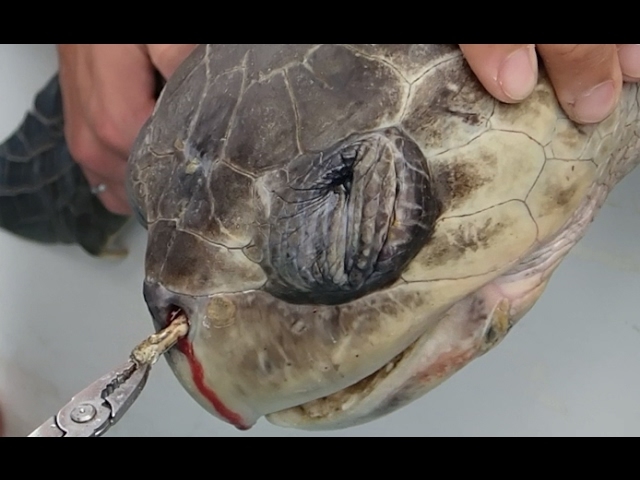 Like almost everyone who watched the 2015 viral clip, London Grill proprietor Terry Berch McNally physically cringed when she saw the closeup of scientists painstakingly extracting a 4-inch tube of plastic from the left nostril of an olive ridley sea turtle. Right then and there, she decided she wanted to stop offering plastic straws at her Fairmount tavern. Berch McNally wasn’t alone. The video sparked several global and national anti-straw campaigns and breathed new life into others that already existed. On average, it’s estimated that Americans use 500 million straws a day. Which means we throw away 500 million straws a day, because who reuses straws? The thin columns of plastic then end up in the trash, and — if they haven’t been blown off tables directly into gutters and other bodies of water — they will, along with many other plastic products, make their way into the ocean. It’s estimated that between 80 to 90 percent of all marine waste is plastic, and straws specifically are in the top 10 list of items collected during International Coastal Cleanup Day events. For most people, in most cases, using a straw is totally and completely unnecessary. Getting rid of all plastic straws in the restaurant. It's a big change. I can't live with the environmental impact of them. Everyone is on board. It took Berch McNally a couple of years and a few more nudges from ocean researcher friends, but she finally made the change. Customers at her neighborhood spot do still have the option to sip their soda through a tube, but it will be one made of plant-based compostable plastic, not the regular petroleum-based stuff. Plus, they have to ask for it. All drinks are now served strawless, with straws given out only on request. London Grill is part of a growing cohort of Philly restaurants jumping on the anti-plastic-straw train. Franklin Fountain in Old City has been stocking paper straws for years, as has the tasting room at Philadelphia Brewing Co. East Passyunk’s P’unk Burger uses a compostable type, and so do Doobies Bar in Rittenhouse and Peddler Coffee by Logan Square. Martha in Kensington still stocks the regular kind, but only puts them in drinks when customers specifically ask. While ways of dealing with it vary, all these restaurateurs have recognized that plastic straws are an environmental hazard that’s relatively easy for them to address. Over the past couple of months, Reed has tried alternatives made of both paper and plant-based plastic. “Some people complain about the paper,” he admitted, referring to the common gripe that paper straws can get slightly soggy at the sipping end. “I say drink a little faster,” he joked. “To break them down, you need an industrial composting facility,” Ives explained. That kind of facility is found in many West Coast towns and cities, where compositing is mandated and a bin is picked up outside your house along with recyclables and trash, “but I don’t think you have that in Philly,” she said. (We don’t, but it’s been recommended). That kind of facility does exist in Ives’ hometown of Seattle — where local government just passed an ordinance banning use of petroleum-plastic straws, cutlery and to-go containers; restaurants there must be free of those items by September of next year. However, they will be allowed to use BPI-certified plant-based plastic. A similar ordinance was recently adopted by Santa Cruz County, California. That’s where The Last Plastic Straw founder Jackie Nunez lives, and she offered a second reason bioplastic straws aren’t an ideal solution. “They rarely make it into the right bin!” Nunez said. If they get tossed in with recycling, she noted, they’ve just contaminated a whole batch, because they’re not traditionally recyclable and are often covered with food waste. And if they get thrown into the trash — or just on the ground in sidewalks and parks and streets — they basically act just like regular plastic. But for many Philly restaurateurs, paper straws bring the potential of unhappy customers — not something to be dismissed lightly. Patti Brett, owner of Doobies, thinks no straw is better than a soggy one. That holds true across the board. Data collected by organizations like Lonely Whale and Last Plastic Straw show that if they are given only on demand, food establishments lower their straw consumption between 65 and 90 percent.